I run into a slight problem when knitting the second front band of MIL's cable-trim jacket. It was very clear that I had to find another way to make the buttonholes, since the ordinary method would have made the second cast-off stitch to run into the cable. There are only two purl stitches between the cables, and this jacket is so heavy it needs bigger buttons than those going through a one stitch bind off or eyelet button hole. The answer was to be found in my knitting handbook Vogue knitting, a very good book for knitting problems like this. I highly recommend it. 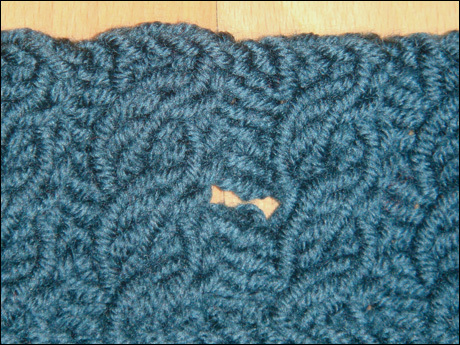 A scrap yarn was knitted over the two stitches between the cables. The stitches are picked up on the wrong side after the front band has been finished, plus two extra stitches in the edges. One round is knitted with the main colour yarn, and the live stitches are stitched down one after another on the wrong side of the front band. … and from the right side. Neat, isn’t it, with undisturbed cables. And there was enough yarn for all the front bands, but only about 15 grams extra. I'm on to seaming now. I started a new project. This is my perfect timing, when the worst heat is over, the vacation is almost over (schools start in two weeks) and everybody over here starting to think about autumn, then I pick out my cotton yarn and start knitting a summer top. Okay, I did cast on when we were in the archipelago, but I haven’t had that much time to knit on it. It should be a fast knit, and I hope to be able to wear it before it cools down here finally. I’m a bit unsure about the colour, I ordered it without looking at the shade card in real, and it looked much brighter on my screen. I had in mind to make the crocheted parts in a pinker yarn, but it doesn’t go together with this colour at all. I think I have enough yarn in this colour to use in the crocheted parts too, and then I can dye over the whole thing in brighter red if it looks terrible. On another note, remembering my agonies over Solveig Hisdal's beautiful but ill-fitting boxy sweaters? Take a look at Eunny's creation, I can't wait for that pattern to be out! I have worked hard on the Cable-trimmed jacket for MIL. In the heat. I should get a Top-Daughter-In-Law medal for this. Jokes aside, this yarn is very rewarding, it is nice to knit with, and is, despite the 100 % merino wool content, not hot to knit at all. And we have been travelling a bit, and watched a couple of seasons of The underground army on DVD (anybody remembering this from the beginnings of the 1980’s? Funny parody on Frenchmen, Englishmen, Germans and Italians during WW II, perhaps even funnier when one isn’t a F, E, G nor I). Good knitting time when you’re in for plain stockinet stitch. The last of the second front on the beach. Last Sunday we went down to Hankoo. It’s a yearly visit for us, hubby spent his childhood summers here, and as well his father’s parents as my father’s parents were home from Hankoo. It’s a very picturesque summercity, but emptier and windier and colder in the winters. There are lovely sand beaches and also those with more stones. It takes 1,5 hours with car to get there, and the same back. Yes for knitting in the car! I was halfway through the first sleeve on the way home. Yarn nest kids on HUS’ (Hangö Udds Segelsällskap) beach. They are having a snack on the same stones where their great-grandfather always used to sit before and after swimming. I have finished the sleeves and they are now blocking. They asked for some recalculating, MIL has shorter arms than what the pattern gives you. But no big problems, other than the fact that I’m afraid I’m going to run out of yarn. The collar took one full ball of yarn, and I didn’t even make it as wide as described in the patter. This yarn amount, 20 balls, was supposed to be enough for one size bigger too, so I didn’t even buy an extra ball, something I usually do. I have never made cables on trimmings before, so this might be ordinary stuff for those of you who have done it before. 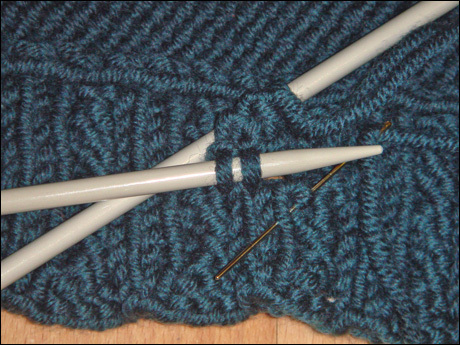 The front bands are constructed so that you first pick up stitches to make a row of 2 knit 2 purl stitches. 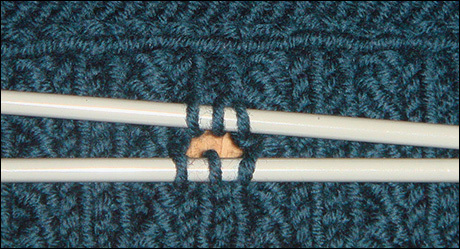 Then on next row to you increase one stitch in every knit stitch, giving you the four stitches you need for the cable. The band is not increasing in width since the cable is decreasing the level of the four stitches. Very neat, and the first front band is absolutely straight. I have calculated where to put the buttons and have started the right front band. I will have yarn for the front band, but the problem is the collar. It is knitted, but there will be a cable trim on the front edge of the collar too, and when I reach that point I’ll be sailing on dangerous water. We'll see tomorrow if it was enough. 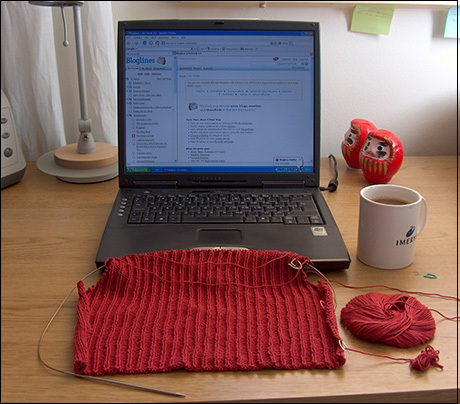 Knitting interrupted - I got an e-mail! For a while I have heard some noise from the closet where I keep things not in use. Well, in fact there started to be a small murmur last autumn (when somebody went to fashion school, and started blogging about sewing too), but it has grown in decibels over the summer. I have tried to totally ignore the noise, and I managed pretty well until it started to get higher. There is not much else to do other than starting to dig through the fabric stash (it’s pretty small, I usually bought fabric like yarn, always with a specific project in mind), and hauling the machines out of the closet. It’s the sewing machine that is noisy, the serger is a silent work horse**. Both machines are about 15 years old, and were in frequent use when the kids were younger. I used to sew most of their clothes, and quite a lot for my self too. Going back to law school had a very negative influence on my sewing time, and I was quite weary of the transfer from being a Stay-at-home/work-at-home Mum to being a SAHM/WHAM/Study-in-the-library Mum. So I quit sewing actively. I think that the fact that I am again used to both study, do the work I do and being with the kids and keeping up the home, combined with the fact that the kids are four years older now, have longer school days and are much more independent, are the biggest reasons why I hear the noise from my sewing machines again. And there are so many knitters that have started to sew too. Why is this so? Is it because when you have reached a certain level of knitting skills you get disturbed by the fact hat finding good fit in store bought clothes is sometimes very hard, and since you get your knitted garments to fit well, you want your clothes to do it too? Or is it because you use your creativity when knitting in order to get a sweater or whatever to look just like you like it to look, and you want your clothes to look the way you want them to, too? *I know my sewing machine got some help from a certain rabbit. I blame it all on you Becky :-D, but I'm also very thankful that you have helped me hear that noise again. I have missed it. **And now is the sewing machine just purring. Like a cat with a saucer of cream in front of it. Best to hurry down to the beach with the kids as long as it's pleased. And take the knitting bag with me. Lots of progress, even if not cabling yet! My hands are flying over the stitches of this work! 6 mm needles, an old circ I got with my Mum’s collection when she gave me everything knitting related she had some 15 years ago, an Aero according to the package, with nice pointy ends and flexible plastic needles. But the wire, oh my! Look! I must try Sia’s trick and put the wire in boiling water, hot water alone didn’t help, nor hot oven. I bought a new one in the local Citymarket, a Novita 6 mm, but it felt like the yarn was about to glue itself to the needles. Too much friction for my taste. So I stick to the Aeros, even if the wire is a mess. The ribbing is made with 5 mm needles, but here I’m on safer waters, I have an Addi circ (that I love) that makes the finer gauged work a dream to do. Big piece to the right: blocked back piece. Sausages to the left: completed unblocked left front, partial right front. I started to knit on the cable-trimmed jacket when we went to the archipelago this Monday. It takes about 1,5 hours in the car to drive from close to Helsinki where we live down to Kimito where the island is situated. I knitted almost 2 balls on the way down and started the fourth ball on the way home. I couldn’t knit on it while on the island, since I was under the eyes of MIL herself, and finishing the Kimono shawl was a high priority too. I finished the back piece while watching Nanny McPhee with the kids on Thursday, and the fronts, well, they grow with the speed of light. As you can see, I'm halfway with the second one! On a totally other note, have you all Finnish knitters seen that Kristel has put up details for our own version of the Secret Pal? 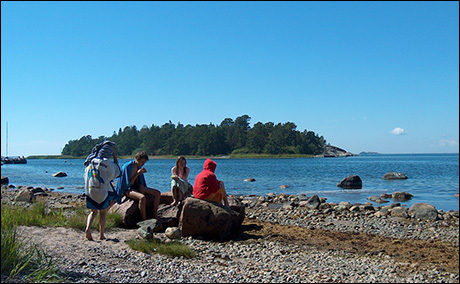 The Salainen Ystävä 2006 is about to start in August, so hurry up and send in your participation details before 30.7. See you there! Bildsekvensen som följer är klassisk, men, för mig i alla fall, alltid lika fascinerande. Hur kan en hög av oidentifierbart innehåll transformeras till en schal bara med hjälp av vatten, nålar och tråd? The picture sequence that is to follow is a classic one, but, for me at least, always as fascinating. How it is possible to transform a heap of yarn into a beautiful shawl with the help of only water, pins and tread? Garn högen i sommarljuset på terrassen. The yarn heap, waiting on the in the summer sun. I sköljvattnet. Jag har inga vajrar för att spänna ut schalen, så jag har trätt en stadig bomullstråd längs alla långsidor. Wet blocking. I have no blocking wires, so I treaded a sturdy cotton tread along all the straight edges in the shawl. Schalen utspänd på reservmadrassen. Trådarna sträckta (Se detalj här) och lämpligt antal nålar stöttar trådarna. Trådarna gör att det behövs färre nålar, och de ger en liten kanteffekt i de alltid räta kantvarven. The shawl blocking on the spare mattress. The treads are tightened (Click here for detail picture), and a suitable amount of pins attached to help block out the shawl. Thanks to the treads are not so many pins needed, and they also give the garter stitched edges a slightly scalloped effect. Projekt detaljer: Kimono schal av Cheryl Oberle från Folk shawls. Garn: Grignasco Merinosilk (75 % merinoull, 25 % silke), färg 318. Stickor: 3,5 mm bambu rundsticka. Project details: Kimono shawl by Cheryl Oberle from Folk Shawls. Needles: 3,5 mm bamboo circs. Vädret är grått idag (vi hade till och med lite regn!) så det blir inga poserandes utomhusbilder, utan bara denna av schalen vilandes på Ali. Ali är inte en lämplig jacka att bära med schal, men jag gillar färgkombinationen, så när Ali var på provdockan lät jag henne bli under. Se på glansen i garnet! Min gamla spinrock i bakgrunden passar in i färgschemat den också. The weather is very grey today (we even had some rain!) and there will be no outside pictures, only this one of the shawl resting on Ali. Ali is not a suitable jacket to wear with the shawl, but it was on my mannequin, and I love the colours together. Look at the shine in the yarn! And my old wheel in the background picks up the colours too! Klicka här för alla inlägg om kimono schalen! Click here for all entries on the kimono shawl! Vi kom hem idag efter en tre dagars vistelse i Åbo skärgård. Vädret var fint, och vi var mycket ute, men det blev ändå en del stickat både på mornarna och kvällarna. Men, före vi reste iväg fick jag klart Johns draksockor. De var dock ännu fuktiga när vi reste, så jag hann inte visa upp dem. We came home today after a three-day trip to the archipelago of Turku. The weather was beautiful and we were out most of the days, but I got quite a lot knitted in the mornings and the evenings. But, before we left for the archipelago, I managed to finish John’s dragon socks. They were still blocking when we travelled away, but were dry and in photo shape when we came back. Click here for close up! Projekt detaljer: Here There Be Dragons Socks av Theresa Walunas. Bonus: Jag lärde mig ett nytt sätt att göra en häl med korta varv. Project details: Here There Be Dragons Socks by Theresa Walunas. Bonus: I learned a new way to make short row heels. Theresas monster är mycket bra uppgjort, och medförde inga som helst problem. För att klara den nya hälen med omslag måste jag konsultera den bifogade länken till en fotoserie, men det var inget problem, det var en inlärningsprocess. Den mönstrade hälen och tån mycket elegant planerade. Theresa’s pattern is very clear, and gave me no problems. I needed to look at the link to the photo tutorial in order to make the yo- shortrow heel, but that was not a problem, just a learning process. The patterned heel and toe are both very cleverly constructed. Klicka här för alla inlägg om drak sockorna! Click here for all entries on the dragon socks! Färdiga produkter för denna vecka: Ali och fem färskmålade fönsterramar. Under arbete: två fönster, två dörrar, Draksockorna, Kimonoschalen, Sampler stole och svärmors tröja. Finished objects of the week: Ali and five freshly painted window frames. Still under work: Two doors, two windows, the Dragon socks, the Kimono schawl, the Sampler stole and MIL's cabled cardi. Projekt detaljer: Ali från Kim Hargreaves collection New beginnings. Garn: Rowan WoolCotton, 12 bollar i färgen Gipsy. Stickor: 3mm och 3,25 mm. Stickfasthet: 25 maskor och 36 varav gav 10x10 cm. Project details: Ali from Kim Hargreaves collection New beginnings. Yarn: Rowan WoolCotton, 12 balls in colour Gipsy. Needles: 3mm and 3,25 mm. Tension: 25 stitches and 36 rows gave me 10x10 cm. Alterations: I didn't make the high garter stitch border, and thus put part of the decreases in the sides. The buttons are a big lower to harmonize this alteration. The shawl collar was supposed to be casted off, and then sewn together. I kept the stitches live and grafted them together. The collar is very neat and flat as a result. Se alla postningar om Ali. See all entries on Ali. Cable-Trim Jacket - ready set go! Startskottet för svärmors 70 års present har gått, då garnet till jackan anlände idag. 20 nystan av härliga Jaeger Extra Fine Merino Chunky i färgen Teal som skall bli Cable-Trim Jacket från Rowans bok Classic knits for real women. Mönstren i boken är designade av Martin Story och Sharon Brant. Jackan stickas på stickor nummer 5 och 6 mm, så jag tror jag har en chans att nå målet i tid, dvs. före slutet av augusti. Svärmor har talat om den här 70 års presenten i ett par års tid, och förberett mig mentalt på vad hon verkligen vill ha i present. Vem kan motstå det! The yarn for MIL's 70 yo present has arrived, and the jacket's way to finished birthday present has begun. 20 balls of wonderful Jaeger Extra Fine Merino Chunky in the colour way Teal are about to, with the help of needles 5 and 6 mm, be transformed into the Cable-Trim Jacket from Rowan's book Classic Knits for real women. The patterns are designed by Martin Story and Sharon Brant. MIL has been talking about this jacket for a couple of years already, so to say preparing the grounds in order to be sure to get the hand knitted jacket. And who can resist that! Även på Ali har framsteg skett. Båda ärmarna är färdiga och pressade. Bakstycket och det ena framstycket är färdiga men opressade, och det andra framstycket förbi hälften av intagningarna. På bilden ser man bra hur mycket mönstret breder ut sig då det pressas. Ärmarna ser ut som om de skulle vara för stora för ärmhålen, men det beror alltså endast på skillnaden i det opressade och det pressade materialet. Jag beslöt mig för att sticka en korare alltid rätt kant än vad mönstret föreskrev, av de tre varven med intagningar måste jag följaktligen flytta två till sidorna. Också knapparnas placering är lite lägre än i Kim Hargreaves mönster. Jackan är definitivt tamare än ursprungsmodellen, men då erfarenheten säger mig at jag inte klär mig i ett plagg med en sådan nedre kant, är det här ett bättre val. Skall vi säga att jackan är mera klassisk så här, det låter bättre än tamare, eller hur. I have made some progress on Ali. Both sleeves are knitted and blocked, and the back and one front is knitted, the second front being halfway up through the decreases. You can clearly see the difference in the blocked and unblocked fabric, the sleeves looks way too big for the body, but this comes from the blocking. The body is also looking like made for a too skinny person. I decided to leave out part of the garter stitch border at the beginning of the body. Two of the three sets of decreases are moved to the sides, and the positioning of the buttons is slightly different than in Kim Hargreave’s version. The jacket is not as hip as the original, but I know this is a better alternative for my body. So, let’s call it classic, that sounds better, doesn’t it? Javisst, jag har startat ett spets projekt. Det tog lite tid att ta mod till mg och börja på ett nytt spetsprojekt, efter att jag lagt Sampler stole tillfälligt på hyllan. Det är Kimono schalen ur Cheryl Oberles bok Folk shawls, som torde anses vara relativt lätt. Garnet är ett merinoull-silkesgarn, producenten kan jag inte mera påminna mig om, och jag använder stickor 3,5 mm, Clover bambu rundsticka, vars spetsar är lätt trimmade med en nagelfil. Ganska fnuttiga ser mina 3,5 mönsterborder ut, men det ser bättre ut efter pressning. Oh yes, I have started a lace project. It took some time to get it going after the stalling of the Sampler stole. It is Kimono shawl from Cheryl Oberle’s book Folk shawls. The yarn is a merino-silk blend from a yarn manufacture that right now escapes my memory. I’m using Clover bamboos in size 3, 5 mm, with tips slightly trimmed with a nail file. I have managed to knit about 3, 5 of the 25 pattern repeats.